It was lights, camera and action as Northern Ireland’s young film-makers showcased their creative skills at this year’s Moving Image Arts Showcase. The annual 2-day event brought a range of films that included ‘edge of your seat’ horror films, to laugh out loud comedies, space travellers and mice detectives to the big screen! 21 students from across GCSE, AS Level and A Level saw their work screened this week at the Brunswick Cinema, Derry~Londonderry and, for the first time, at Odyssey Cinemas, Belfast. The only qualification of its kind in the UK, CCEA Moving Image Arts has grown in popularity over the past ten years, with over 1500 students annually taking the course across both A level and GCSE. Commenting on support for the Moving Image Arts Showcase, CCEA’s Subject Officer Ingrid Arthurs commented: “The Moving Image Arts showcase would not be possible without the continued support of our industry partners – Foyle Film Festival, City of Derry Crystal, NI Screen, Cinemagic and Odyssey Cinemas. Their support makes it possible to celebrate the work produced from this unique qualification and shine a spotlight on the creative skills that sits within our schools. We are also so pleased that many film professionals took the time out of their busy schedules to recognise the work of Moving Image Arts students. 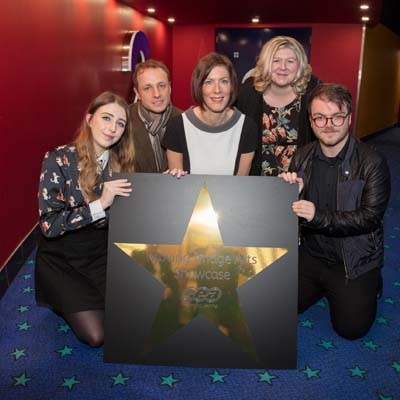 Bernard McCloskey, Head of Education at Northern Ireland Screen and chair of the judging panel commented: “Congratulations to all the students who have had their work screened at this years’ Moving Image Arts Showcase, you all have so much to be proud of. Northern Ireland Screen is privileged to have worked so closely with CCEA in the development of the Moving Image Arts qualification and to support the annual showcase.